In a deep sense, we know a lot more about the population genetic history of England at the fine-grain than we do about the whole continent of Africa. That’s going to change in the near future, as researchers now realize that the history and emergence of modern humans within the continent was a more complex, and perhaps more multi-regional, affair than had been understood. Because of the relative dearth of ancient DNA, there has been a lot of deeply analytic work that draws from some pretty abstruse mathematical tools operating on extant empirical data. A series of preprints have come out which use different methods, and arrive at different particular details of results, but ultimately seem to be illuminating a reoccurring set of patterns. Dimly perceived, but sensed nonetheless. We inferred an archaic population to have contributed measurably to Eurasian populations. This branch (putatively Eurasian Neanderthal) split from the branch leading to modern humans between ∼ 470 − 650 thousand years ago, and ∼ 1% of lineages in modern CEU and CHB populations were contributed by this archaic population after the out-of-Africa split. This range of divergence dates compares to previous estimates of the time of divergence between Neanderthals and human populations, estimated at ∼650 kya (Pr¨ufer et al., 2014). The “archaic African” branch split from the modern human branch roughly 460 − 540 kya and contributed ∼ 7.5% to modern YRI in the model (Table A2). We chose a separate population trio to validate our inference and compare levels of archaic admixture with different representative populations. This second trio consisted of the Luhya in Webuye, Kenya (LWK), Kinh in Ho Chi Minh City, Vietnam (KHV), and British in England and Scotland (GBR). 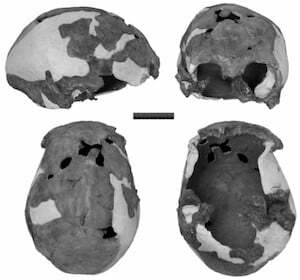 We inferred the KHV and GBR populations to have experienced comparable levels of migration from the putatively Neanderthal branch. 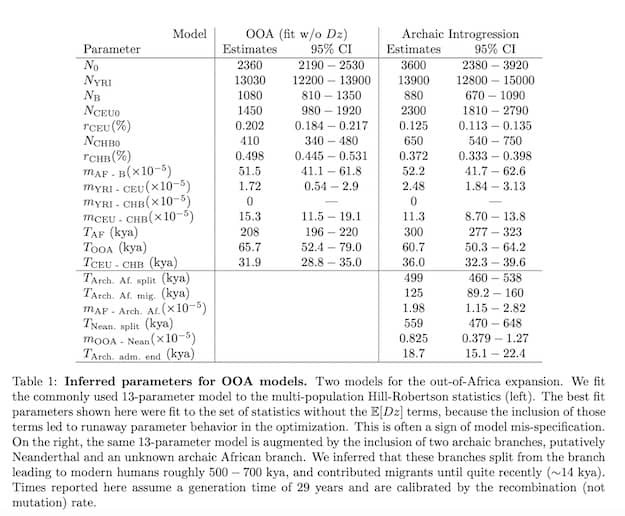 However, the LWK population exhibited lower levels of archaic admixture (∼ 6%) in comparison to YRI, suggesting population differences in archaic introgression events within the African continent (Table A3). To be frank I’m not sure as to the utility of the term “archaic” anymore. I sometimes wish that we’d rename “modern human” to “modal human.” That is, the dominant lineage that was around ~200,000 years ago in relation to modern population ancestry. But, these results are aligned with other work from different research groups which indicate that something basal to all other modern humans, but within a clade of modern humans in relation to Neanderthal-Denisovans, admixed with a modern human lineage expanding out of eastern Africa. The LWK sample is Bantu, and has a minority Nilotic component that has West Eurasian ancestry. This probably accounts for the dilution of the basal lineage from 7.5% to 6%. I wouldn’t be surprised if the final proportions differ. 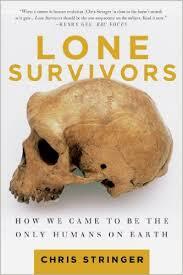 And other research groups have found deep lineages with African hunter-gatherers. My own view is that it does seem likely that one of the African human populations that flourished ~200, 000 years ago expanded and assimilated many of the other lineages. The “Out of Africa” stream is one branch of this ancient population. But it seems possible that the expansion was incomplete, and that other human lineages persisted elsewhere until a relatively late date. The genetics of African populations reveals an otherwise “missing layer” of human variation that arose between 100,000 and 5 million years ago. Both the vast number of these ancient variants and the selective pressures they survived yield insights into genes responsible for complex traits in all populations. The main issue I might have is I’m not sure that focusing on 5 million year time spans is particularly useful. Rather, looking at the last major bottleneck for modern humans before the “Out of Africa” event would be key, since that’s when a lot of the common variation would disappear, and very rare variants probably don’t have deep time depth in any case. With all that being said, the qualitative analysis is on point. One of the major issues in the “SNP-chip” era has been that ascertainment of variation has been skewed toward Europeans. 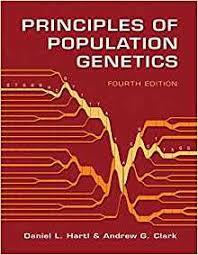 Though more recent techniques have tried to fix this…this review points out that if you by necessity constrain the SNPs of interest to those that vary outside of Africa (most of the world’s population), you are taking may alleles private to Africa off the table. This is relevant because the “Out of Africa” bottleneck ~50,000 years ago means that African populations harbor a lot more genetic variation than non-African populations do. The move to high-quality whole genome sequencing obviates these concerns. As a matter of course African variation will be “picked up” since the marker set is not constrained ahead of time. 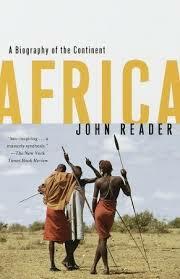 Importantly the authors focus on South Africa and the Xhosa population. This group has about ~20% Khoisan genetic ancestry, which is very diverse, and, very distinct, from that of the remaining ~80% of its ancestry. With its large African immigrant population and highly diverse native groups, some of them quite admixed, South Africa could actually provide some hard-to-substitute value in biomedical genetics. Martin Meredith’s The Fortunes of Africa glosses very quickly over one of the major reasons that the “great scramble” for the continent occurred in the late 19th century, the discovery of the usefulness of quinine as an anti-malarial agent. 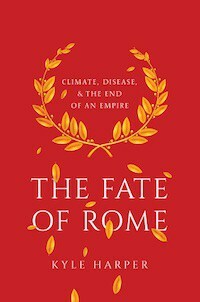 Perhaps because I’ve read Plagues and Peoples and The Retreat of the Elephants: An Environmental History of China, I have always been conscious of the role of disease in discouraging conquest and migration (malaria in Italy was also a way to limit the extent of long-term occupation). 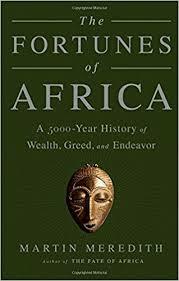 For all these centuries the heart of Africa was unknown to Europeans, in part because there were native powers blocking their way, but also because the mortality rates were so high for outsiders, as indicated above. 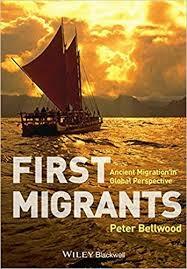 It is no surprise that the main European settlement in Africa which was more than a simple trading fort was at the southern tip of the continent, where the climate was Mediterranean and so the disease burden low. But once quinine, and machine guns, came into the equation the interior was accessible. It all happened rather quickly in a few decades, though in some cases European ‘colonialism’ involved little more than nominal allegiance of tribal chieftains. The general results of the paper, Skoglund et.al’s Reconstructing Prehistoric African Population Structure, were presented at the SMBE meeting this summer. So in broad sketches I was not surprised, though the details require some digging into. Between 1000 BC and 500 AD the expansion of iron wielding agriculturalists from the environs of modern day southern Cameroon reshaped the cultural and genetic landscape of Sub-Saharan Africa. The relatively late date of this expansion should give us a general sense of how careful we need to be about making assertions about “prehistoric Africa.” When Egypt’s New Kingdom was expanding southward along the Nile and into the Levant, Sub-Saharan Africa was qualitatively very different from what we see today in both culture and genetic structure. 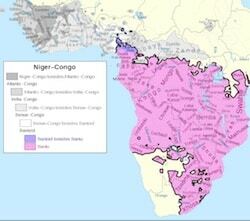 The continent’s contemporary human geography does not have a deep time depth. In any case, anyone who has worked with genetic data from Africa is struck by how similar Bantu-speaking populations are genetically. So these results are not world-shaking. South African Zulus occupy positions far closer to Kenyans and Congolese than they do to Khoisan peoples to the west of them facing the Kalahari. The Xhosa people on the cultural frontier of the Bantus in South Africa exhibit substantial admixture from Khoisan (to the point where they have even integrated clicks into their language! ), but even they are preponderantly non-Khoisan. 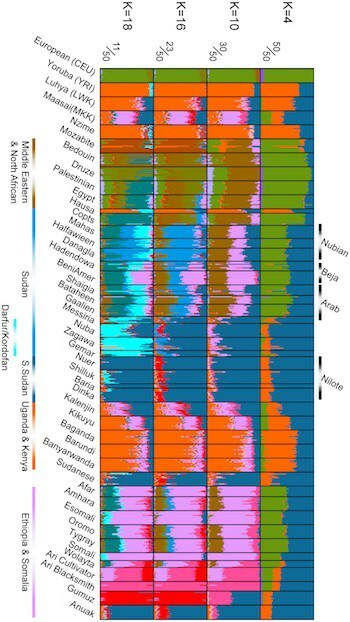 By sampling ancient genomes across a geographical transect which runs up the Rift Valley to Ethiopia, Skoglund et al. 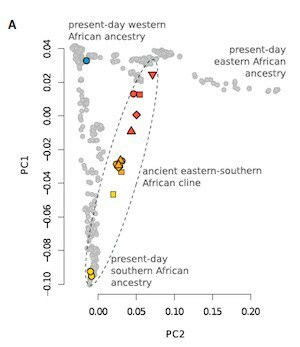 show that before the Bantu Expansion there was a north-south genetic relatedness cline. When this result was presented at SMBE a few friends were quite excited that they were being presented a cline, as some researchers have felt that this particular lab group has a tendency to model everything as pulse admixtures between distinct ancestral populations. But the reasonably deep time transect in Malawi exhibited no variance in admixture fractions, which is indicative of the likelihood that its “mixed” status at a particular K cluster is simply an artifact (see this post for what’s going on). One particular aspect of the results from Malawi is that they found no continuity between contemporary populations, Bantu agriculturalists, and these ancient hunter-gatherers. That is, hunter-gatherers were replaced in toto. This is not entirely surprising, as many researchers who have worked with European ancient DNA believe that hunter-gatherers in many areas left no descendants at all as well (the “hunter-gatherer” fractions in modern groups in a particular region are believed to be due to migration of mixed populations who obtained “hunter-gatherer” ancestry at another locale). These results also have some moderate surprises. A Tanzanian sample from 1100 BC from a pastoralist context exhibits an ancestral mix which is Sub-Saharan African and West Eurasian/North African. More precisely, about 38 percent of this individual’s ancestry resembles that of the Pre-Pottery Neolithic culture of the Levant, and the rest of the genome most resembles a 4500 year old sample from Ethiopia. This date is before the initiation of the Bantu Expansion. The genetic results in this work, and earlier publications, strongly points to the likelihood that this population(s) mediated the spread of pastoralism to the south and west. In particular, all Khoisan groups of southern Africa seem to have admixture from this group, more (Khoi) or less (San). But a curious aspect of this result is that these early pastoralists do not carry any evidence of admixture from ancient eastern farmers from the Zagros region. That is, the West Eurasian gene flow into the Tanzanian pastoralists predates the great exchange/admixture in the Middle East between western and eastern lineages. Since that reciprocal gene flow seems to have occurred at least 2,000 years before the Tanzanian pastoralist’s time, it suggests that this West Eurasian element was in Africa for thousands of years. The second important point to emphasize is that the Iranian-like component is found among Cushitic speaking Somali and Afar samples, at 15-20% clips. Looking at the supporting tables a wide range of East African populations have the Tanzanian pastoralist ancestry but do not show evidence of the Iranian-like ancestry, which is now ubiquitous in the Middle East, and presumably in the highlands of Ethiopia as well (which usually show somewhat higher levels of Eurasian ancestry than is the case on the coast, especially among Semitic language speakers). This fact is important because many of the Nilotic peoples are reputed to have absorbed Cushitic groups relatively recently in the past. This is also true for Bantu speaking groups according to these and other data. Finally, the Sandawe, who speak a language with clicks, and so may have some affinity to Khoisan, are often stated to have Cushitic affinities (looking at the data they clearly have West Eurasian ancestry). But their Eurasian ancestry seems to lack the Iranian-like component as well. 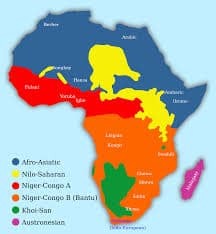 None of the populations with putative Cushitic ancestry, but who lack Iranian-like ancestry, speak a Cushitic language (most speak Nilotic languages, but East African Bantus have mixed with these Nilotic groups, so they have the same ancestry). Therefore I wonder if these pastoralists spoke an Afro-Asiatic language in the first place. The phylogenetic tree illustrates the relationships of various African populations without much recent Eurasian ancestry. In The New York Times article David Reich indicates that the Hadza people of Tanzania are the closest Sub-Saharan Africans to the lineage ancestral to non-Africans. This is actually a simplification of what you see in the paper, and is illustrated in the tree to the left. The 4500 year old Ethiopian sample, which does not have Eurasian ancestry, nevertheless is the closest of all Sub-Saharan groups to Eurasians. The Hadza have the highest fraction of this ancestral component of all Sub-Saharan Africans in their data set, but many other populations also carry this ancestry (the Tanzanian pastoralist combined the PPN ancestry with this element). This was a patchy landscape of inhabitation, because though the Tanzanian pastoralist ancestry, a combination of PPN and proto-Ethiopian, spread all the way to the Cape, there were populations, such as the Hadza and a 400 year old individual sampled from the Kenya island of Pemba, which lacked this genetic variation. Indeed, they are also not on the north-south (proto-Ethiopian to Khoisan) cline that featured so prominently above. The sampling of ancient individuals is not very dense yet, so we can’t say much. But I think it does indicate we need to be cautious about assumpting gene flow dynamics as-the-crow-flies, simply a function of distance. Ecological suitability no doubt plays a strong role in how populations expand. The Bantus, for example, were stopped in South Africa by the fact that their agricultural toolkit was not suitable for the western half of the country. So when Europeans arrived in the 16th century the residents of the Cape where Khoi pastoralists. The presence of the Hadza in Tanzania, or an individual of unmixed proto-Ethiopian ancestry on Pemba 400 years ago, indicates that the ethnic geography of East Africa has long been fluid and dynamic. There is no reason to suppose that the Hadza are not themselves migrants from further north, perhaps easily explaining why they are not on the north-south cline so evident from the ancient DNA. Several years ago researchers discovered that the first farmers of Europe, who descended from an Anatolian population, were in part derived from a group which split off very early from other Eurasian populations. This group was termed “Basal Eurasian” (BEu) because it was an outgroup to all other Eurasians, including European hunter-gatherers, East Asians, Oceanians, and the natives of the New World. Subsequent work has shown that the early Neolithic farmers of the Near East, whether they’re from the Levant or the Zagros, had about half their ancestry from this population. No ancient genomes which are predominantly BEu have been discovered yet. The fact that populations on the cusp of the Holocene seem to have Basal Eurasian ancestry across the Middle East suggests that the admixture with hunter-gatherers related to those of Europe must have occurred during the Pleistocene. But Basal Eurasian is arguably the most parsimonious explanation of the shared drift patterns that we see. Skoglund et al. 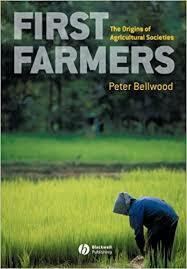 suggest that there may be the necessity of a similar construct in Africa. 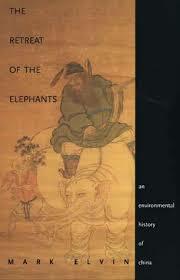 They are not the first, Schlebusch et al. also suggested the necessity of this lineage in the supplements of their preprint on ancient South Africans. Within Skoglund et al. 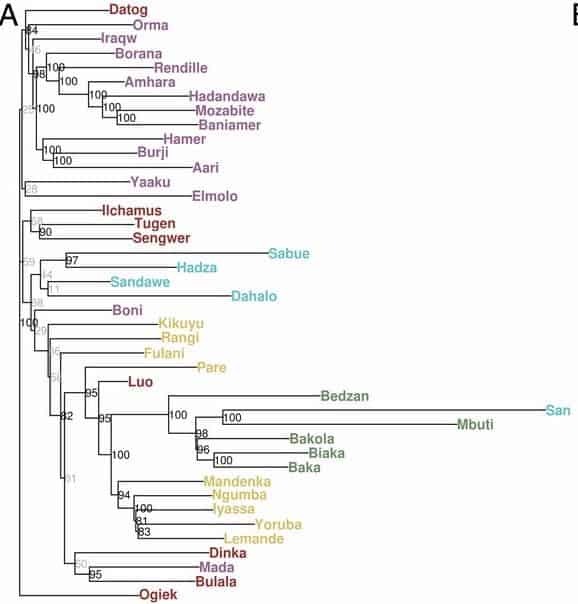 the authors see variation between the far West African Mende and the eastern West African Yoruba, where the latter exhibits closer affinity to East African populations than the former (this includes those such as the proto-Ethiopian with no Eurasian admixture). 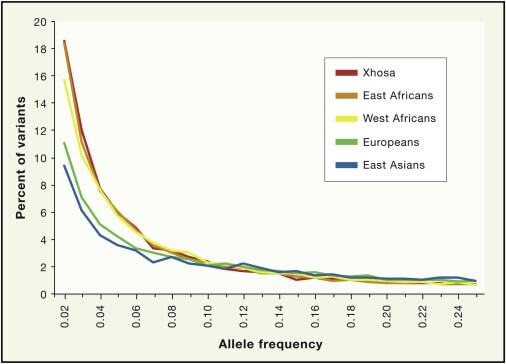 Additionally, the authors found that Khoisan groups share more alleles with populations in East Africa than they do with those in West Africa even when you account for admixture. One model that can explain this variation is long range gene flow, so that there would be connections between various regions as a function of their distance. Another explanation is that West African populations are the product of a Basal Human (BHu) population which separated first, before the bifurcation of Khoisan from other human populations. 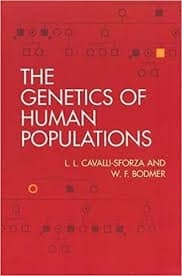 This would reorder our understanding of who the most basal humans are. Additionally, it would align with long-standing work on deep lineages within Africa contributing a minor component of the continent’s ancestry. As should be clear due to the tree above, BHu postdates the separation of African humans from Neanderthals. One does wonder about the relevance of the Moroccan “modern” human to these models. The spread of the Bantus over 1500 years from one end of the continent to the other is perhaps one of the most important dynamics we can use to understand the spread of farming more generally. The linguistic unity of the Bantus, or at least their affinity, suggests to us that the first farmers of Europe, who spread across much of the continent in 2500 years, probably exhibited the same pattern. The low levels of gene flow between hunter-gatherers and farmers, despite living in the same regions for thousands of years, can be illustrated with African examples (e.g., the Hadza vs. their Bantu neighbors). We are rather in the early phase of understanding these dynamics. There are more remains to be found, perhaps in the dry fastness of the Sahara or Sahel? (though unfortunately political considerations may prevent excavation due to danger to archaeologists) The genetics will give us a general idea about the nature of genetic variation and how it arose, but robust cultural models also need to be developed which illustrate how these genetic patterns arose.